QxOrm (the engine) + QxEntityEditor (the graphic editor) = the best solution to manage your persistent data layer in C++/Qt ! JSON API : interoperability with other technology than C++/Qt (REST web services, QML applications, scripting language). QxOrm library is designed to make easier C++ development and provides many functionalities. only one file <QxOrm.h> to include in precompiled-header (precompiled-header file is recommended to reduce compilation times). QxDao : based on Qt QtSql engine, this module provides communication with databases (select, update, delete, transaction...) by mapping database table columns with C++ class properties. The relationships 1-1, 1-n, n-1 and n-n are easy to setup in C++ code. This module supports object-oriented programming : inheritance, polymorphism, modularity. It supports also many containers (stl, boost and Qt : std::vector, std::list, std::unordered_map, QList, QHash...). QxRegister, QxDataMember, QxFactory and QxFunction : QxOrm emulates reflection (or introspection) mechanism (like other languages : Java, C#...). QxModelView : each class registered in QxOrm context can be used by the Qt model/view engine (Qt widgets and/or QML views). qx::IxModel interface exposes automatically to QML engine all properties defined in QxOrm context. This module makes easier interaction between QML and databases. QxService : based on QtNetwork engine of Qt library, this module provides an easy and powerful way to create C++ application server (services concept with request from client and reply from server). QxService uses serialization and introspection from QxOrm library to transfer over network any class or structure. For more details about QxService module, a tutorial is available here. QxCollection<Key, Value> : this container has advantages of std::vector<T> (insertion order + quick access by index) and std::unordered_map<Key, Value> or QHash<Key, Value> (quick access by a key : hash-map). 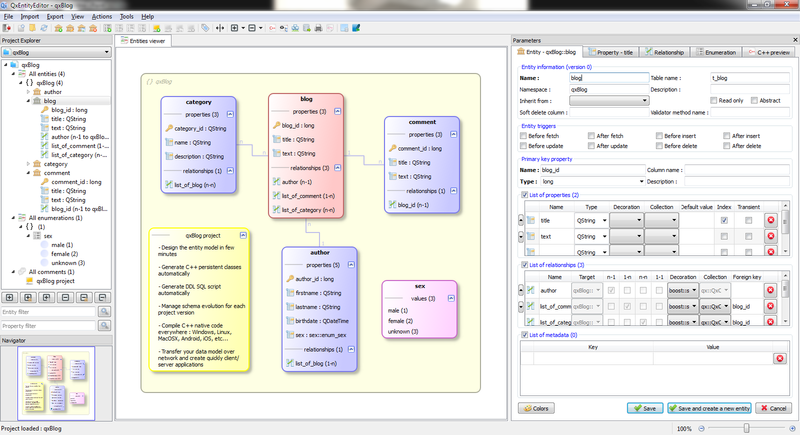 QxCollection<Key, Value> is adapted to contain the items resulting from a database. QxSerialize : this module is based on Qt QDataStream class. Any class defined by QxOrm can be serialized to binary, XML and JSON format. This module also allows to clone all instances of objects. Most of Qt objects (QObject, QString, QDate, QTime, QDateTime, QList, QHash...) are compatible with QxSerialize module. QxTraits : C++ standard library provides several generic traits. QxOrm uses them but needs new functionalities that are not present in std standard library. QxCache : QxOrm's cache can contain all types of objects. It's possible for example to store data resulting from a database to avoid too frequent requests. This cache is generic and can be used in other contexts than QxOrm. QxValidator : this module provides a validation engine for classes registered in QxOrm context. To use this validation engine, you have to define your constraints into the mapping function per class : void qx::register_class. If for an instance of class, at least one constraint violation is detected, then the instance is invalid : the object cannot be saved into database (INSERT or UPDATE). For more information about QxValidator module, read the manual here. QxMemLeak : fast detection of memory leaks in Debug mode (with indication of file and line => MFC style from Microsoft). This module is developed by Wu Yongwei. If another tool is already used in your projects (Valgrind for example), this functionality should not be enabled. By default, QxMemLeak module is disabled. You can download the current version of QxOrm library and QxEntityEditor application here. A manual (user guide) to learn how to work with QxOrm library is available here. A quick sample showing basic functionalities of QxOrm is available here. If you have any questions about QxOrm library or QxEntityEditor application, a forum is available here.